One of the things you will be constantly reminded of when using your computer is keeping your software up to date with the latest releases. Not only do the newer versions often bring new features and functions, but they also include bug fixes and more importantly, security fixes. It’s a waste of time having a fully patched and updated Windows if an old piece of 3rd party software has a major security hole giving attackers easy access to your system. You can easily be exposed to the possibility of a malware infection by simply visiting a malicious website or a website at the wrong time if it has been attacked or hijacked. A malicious attack will then take advantage of your outdated vulnerable software and applications such as such as Java, Flash, Adobe Reader and web browsers are some of the prime targets. Not all outdated software will make your computer less secure, but if you don’t know which does and which doesn’t, it can a painstaking process making sure the most vulnerable applications are fully up to date. There are a number of programs available that can generally check for updates to your software and tell you which ones need updating. There are also tools that can do that and also download and then install the updated applications for you. Those programs though don’t focus on security and are more generalized in their approach which is still very useful. The 3 tools below are geared towards updating software that is more likely or is known to have security issues and can download and then install or patch your insecure programs. Patch My PC is a little bit of an all round updating, installing and removing utility because in addition to a list of several popular free software titles that can be checked and updated by the program, Patch My PC also has the option to contact Windows Update and scan for any Microsoft security or general updates that have yet to be installed. And on top of the updating component of the program, there are also a couple of other very handy features such as a Startup Items tab where your startup entries can be enabled, disable or deleted, and also a useful Uninstaller tab that can be used to uninstall software or delete the registry entry if the entry remains but the program is no longer there. Your installed software is checked automatically on starting Patch My PC and anything that’s been found to be out of date will be shown in red, current versions which have no updates are in green. The software list is split into 2 tabs, Common which has the most popular titles and mostly ones which are more likely to be vulnerable to exploits and attacks, and Other which contains a more general list of software. Each program can be installed if it isn’t already or re-installed or updated. Click to perform the updates and the progress will show in the window. Patch My PC also supports silent updating meaning no interaction is required during installs, and currently there are around 90 pieces of 3rd party software in its database. Definitely one for the USB toolkit. Patch My PC works on Windows XP, Vista and 7. One of the most well known programs which can update your potentially vulnerable third party applications automatically is Secunia. During the install you will be asked if you want to let the program apply the updates it finds automatically, and after a scan (which may take several seconds) the main window will pop up which is is split into two halves, the top for software needing to be updated, and the bottom for programs that are up to date. 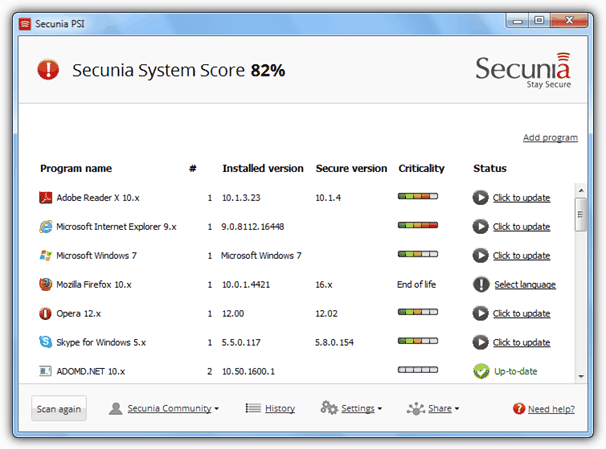 There will be a System Score at the top to give an idea of how secure Secunia thinks the system is based on the outdated programs you have installed. The programs that need updating are not merely those that might have a a few bug fixes or new feature in an updated version, but applications that have been identified as having a security vulnerabilities and an update is needed fix them. Right clicking on one of those applications and selecting “More Information” will take you to Secunia’s website where you can read the report on why the program has been marked as insecure. Using the Detailed view in settings will also show a bar for each application of how critical it is to run the update. Some software is multilingual and might need you to select a language before updating, but if you choose to let Secunia auto update, it will start applying the new versions. If you want to be notified before or after an updated download, the Click to Update button just needs pressing to start the update process for that title. The release of version 3 of Secunia PSI has been quite controversial because many of the more advanced features found in the previous version 2 have been simplified or completely removed. This release is now far more user friendly and a lot simpler to operate for the average or inexperienced person but is at the expense of the more experienced users requirements of more control over the program. If you love version 2, you can continue to use it as Secunia say they have no plans to discontinue support. There is also an online inspector version which is more basic and covers less than 100 programs, but is useful if you just need to perform a quick check without wanting to install any software. Heimdal checks and updates only the vital programs that can possibly be used as a means of causing a malware infection. The list of supported applications monitored by Heimdal is tiny by comparison to other software, but it’s what the developers believe to be the most vulnerable applications that are of the most importance. The supported applications are; Heimdal agent itself, Internet Explorer, Firefox, Java, Skype, Adobe Flash, Adobe Reader, Windows Media Player, Apple Quicktime, Winzip, Microsoft MDAC and Adobe Shockwave. The main interface of Heimdal shows a smiley face with a barometer which you click on to start a scan. Afterwards if it isn’t smiling, your score is below the perfect 100 which means there is some vulnerable software that’s been found and requires patching. The program usually installs with the auto update option enabled so it might already be installing updates for you. 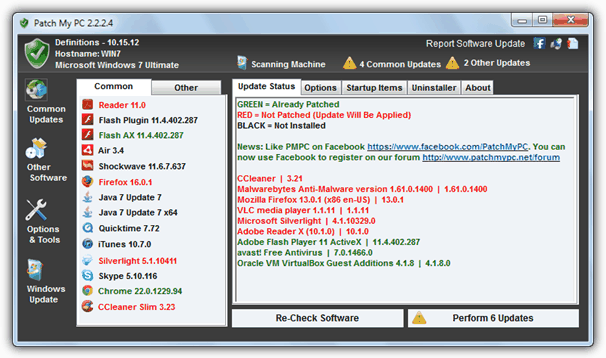 The Software tab will inform you what software has been detected and if it’s doing anything about it such as downloading or patching the software. Heimdal Agent is automatically run whenever Windows is started and sits quietly in the system tray, checking periodically for any needed updates. While testing we were quite confused by Heimdal Agent’s results. Although Adobe Flash, its IE plugin and Apple Quicktime are detected as the latest versions, Firefox doesn’t get recognized after version 10, Opera from version 11 and Chrome, although not in the supported apps list checks if you have from versions 5 to 9 only. Skype, Winzip and Adobe Reader were also not showing the latest major versions. Also some older versions of the supported programs were tried and said to be vulnerable applications but Heimdal failed to or refused to update them. So with this in mind, we’re not quite sure of Heimdal Agent Free’s current development status. Heimdal requires Microsoft .NET Framework 4 Extended to run and is able to automatically detect if you only have the Client profile and download the correct version for you. There is also a shareware version which aims to help block phishing sites and credit card / banking information stealing trojans. Works on XP, Vista and Windows 7. Excellent software. Can’t wait wait to try the Pro version. Thank you! 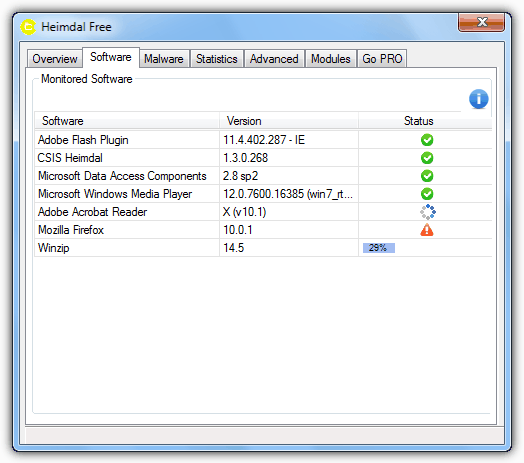 Heimdal Agent is much much more than a simple update checker, hence its price for the Pro version. I am curious to know, in the next days, which of my habits is considered dangerous by Heimdal. Thanks, Ray, will try this one out. Actually, remarkable name. In Old Norse mythology, Heimdal is the guardian of the abodes of the gods. Thank you, Raymond. Handling the update of my own machine is one thing, but then there’s all the friends and relations who come to me for help. I’ve tried explaining and showing them how to do it, but it just doesn’t “compute” for some.